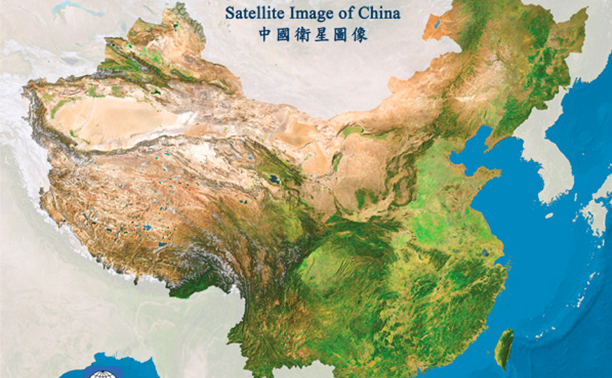 Global Footprint Network reports that China is the world’s largest contributor to annual growth in the demand for ecological resources and services, and has been for the last five years for which data is available. While the Ecological Footprints of many countries declined during the recession, including the United States and Germany, the Ecological Footprints of China and India, the world’s two most populous countries, continued to rise and now comprise about one quarter of the Ecological Footprint of the entire world. However, the Ecological Footprints per person of both China and India remain far lower than those of many high-income countries. For example, the Ecological Footprint per person of the United States is more than seven times higher than that of India and nearly three times that of China. In the past six months, both China and India have announced steps to reduce dependence on fossil fuels, which would decrease their Ecological Footprints. China, in particular, has invested substantially in renewable energy, and its decades-long focus on reducing fertility has also helped preserve its biocapacity per person. But more recent news that China’s annual GDP growth should remain at 7 percent for the years to come suggests its Ecological Footprint will continue on an upward trajectory. The Ecological Footprint of the world – a measure of people’s demand on nature – has begun climbing again after experiencing a 2.1 percent decline in 2009 during the recession, according to Global Footprint Network’s 2015 Edition of the National Footprint Accounts. The world’s Ecological Footprint increased nearly 4 percent in 2010 and nearly 1.7 percent in 2011 (the latest year data is available). 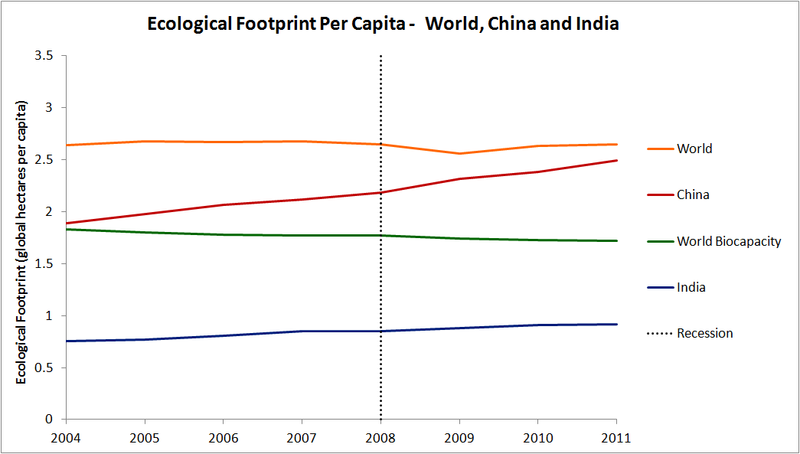 However, excluding China, the world’s Ecological Footprint increased far less in 2011: 0.9 percent. 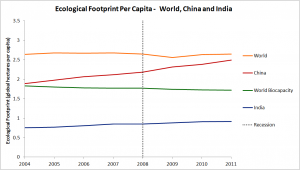 The Ecological Footprint of China climbed 3.6% in 2010 and 5.2% in 2011. The 2015 National Footprint Accounts compare what people demand against what nature can provide. The accounts simply add together all of the human demands that compete for our planet’s biologically productive surface (Ecological Footprint). This demand then can be compared to all of the planet’s productive surfaces (biocapacity), including cropland, forests, pastures and fishing grounds. Using United Nations data sets, these accounts are calculated for approximately 200 nations. 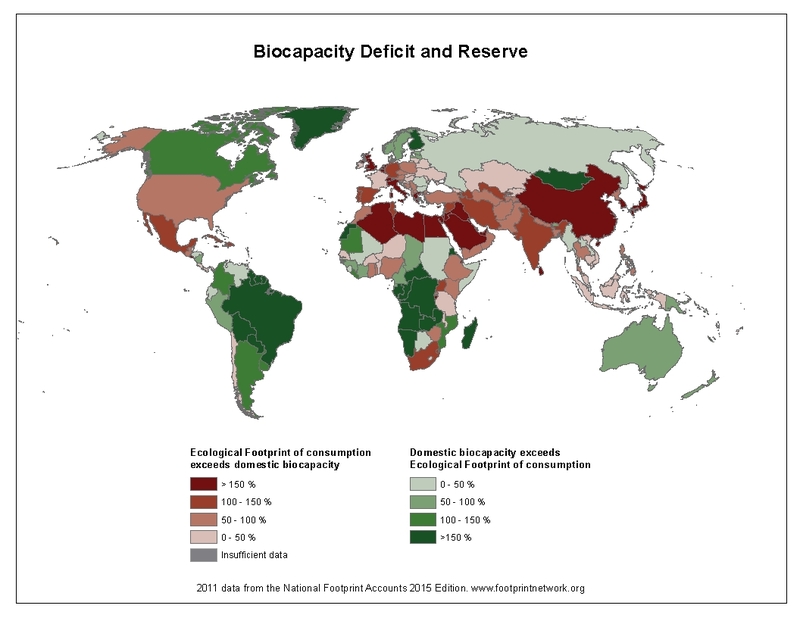 Overall, approximately 71 percent of the world’s population lives in nations with a double challenge: They earn below world-average income (based on Gross National Income) and are running a biocapacity deficit. This means that by 2011, they were using more resources and services from nature than the ecosystems within their respective borders regenerated, based on calculations from the 2015 National Footprint Accounts. Global Footprint Network’s annual update of the National Footprint Accounts shows that each country’s performance varies year to year, but over the last decades, global ecological overshoot – humanity living beyond the budget of nature – has climbed substantially. 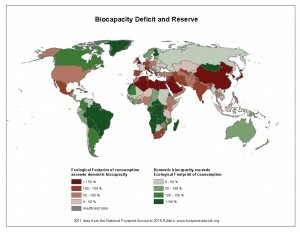 Ecological overshoot now stands at 54 percent above the planet’s biocapacity. This means humanity demands biocapacity 54 percent faster than what our planet can renew in one year. By contrast, our planet had 30 percent more biocapacity than what humanity used in 1961, the first year for which consistent data sets are available.